Includes Magnet And Stand To Allow It To Be Placed Almost Anywhere. With Handy Stand. Can Be Placed Or Stuck Anywhere. 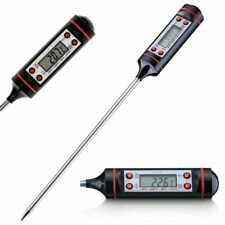 Easy to Read Professional Grade Digital Thermometer measures temperatures from 58 degrees F( 50 C) to 500 degreesF(260C). We will NOT falsify forms of this kind. AND OTHERS ! Phone Number will be required. Compliance Certificate: Manufacturers certificate of compliance available from DeltaTRAK, NIST Traceable, NSF, CE. The needle tip probe was designed to produce a faster response when used in less dense foods per FDA Food Code 4-302.12(B). And you'll see it in just 2 to 3 seconds after inserting the probe. We try our best to resolve any issues as fast as possible. Sound & Vision (13). 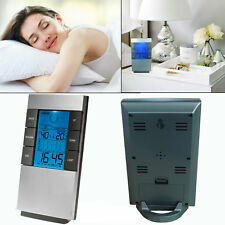 It is equipped with an alarm clock as well as the snooze function, and is great for adults and children of all ages. It is easy to read due to its large character LCD display. It can also work as portable alarm, so you can carry it with yourself while travelling or camping. Waterproof housing. Display Reading Update : 1 second. °C/°F selectable. Display Resolution : 0.1°F/°C. Sensor : Thermistor. Probe Size: 3.9" L (99mm L), 0.14" Dia to 0.1" Dia reduced tip (3.5mm Dia to 2.6mm reduced tip). Display Size/Update: 1.5" X 0.5" (38mm X 12.7mm)/Every 2 seconds. Sealed unibody construction and RoHS-compliant. A variety of culinary projects hinge on the ability to keep a liquid at just the right temperature — from brewing beer to baking a delectable cheesecake in a water bath. The new CDN Floating Thermometer (FT220) makes it easy to accurately measure liquid temperatures because of its reliable technology, intuitive operation, and ability to float. This specialty thermometer is the perfect companion for best results for sous-vide cooking or any recipe requiring a water bath. A water bath, or “bain-marie,” enhances the baking of custards and cheesecakes by ensuring that the center is done before the edges dry out. For brewing beer, water baths are used to improve beer taste by controlling the temperature of the fermentation process. This multipurpose floating thermometer will also come in handy for sauces, soups and stews. Resolution: 0.1℃ (temperature); 1% (humidity). Humidity range: 10% - 90%RH. Accuracy (Humidity): ±5%. Daily alarm function. Large character LCD display, easy to read. 5.2 temperature display modes: °C/°F. Safe-T-Guard Antimicrobial Sleeve and Housing inhibits growth of bacterial odor and mold. Instant Read / Rapid Response. Includes Sleeve with Carrying Cord and Pocket Clip. Hold feature. Updates every one second. This Taylor waterproof compact digital thermometer is dependable in both kitchen and lab environments. Its large display has a hold feature and is easy to read, and the auto shutoff extends battery life. It features a Safe T guard antimicrobial sleeve and housing which inhibits the growth of pathogens; instant read and rapid response; and reads from 40 to 450Â° F and 40 to 230Â° C. Imported. Thin, accurate, and waterproof, the CDN ProAccurate® Waterproof Pocket Thermometer (DT450X) offers added functionality and convenience for measuring the temperature of food in the kitchen. Featuring CDN's exclusive Quick-Read® rapid response, this handy thermometer is the perfect choice for thin cuts of meat, fish or poultry. The waterproof design allows this thermometer to withstand moisture and humidity and will continue to work accurately even if accidently submerged in water. It is also shatterproof and is high-heat resistant, featuring a wide temperature range from -40℉ to 450℉ (-40℃ to 230℃). Includes 1.5V Button IEC LR44 battery instructions. Reduced tip probe. Display Reading Update: 1 second. Display Window Size: 0.77 in W x 0.37 in H (19.5 mm W x 9.5 mm H). Certification: CE, RoHS, NIST traceable, manufacturers certificate of compliance available. Hold button. LCD display. Range: -40 to 450 degrees Fahrenheit (-40 to 230 degrees Celsius). Model# 3519-9. Fast readings. The CDN ProAccurate® Pocket Thermometer makes it easy to check the temperature of foods such as; thin cuts of meat, fish, or poultry. Equipped with a big digit display, this thermometer allows you to quickly check readings at a glance, white its data-hold feature retains the reading on the screen. Designed to provide accurate measurements, this NSF approved thermometer has a six second response time and has a temperature range of -40 to 450℉. This thermometer is perfect for any busy kitchen with its waterproof construction and rust-resistant stainless steel stem, even the handle features a shatterproof ABS plastic. 300mm length. Temperature range -10 to 110°C. Moulded glass non-roll device to help prevent breakage. 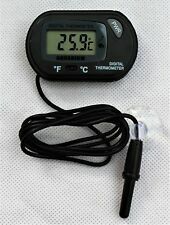 Set this thermometer to any temperature between 32 to 392 degrees Fahrenheit (0 to 200 degrees Celsius), insert the 7 inch probe into a roast or saucepan, and the timer will sound and lights flash when the desired temperature is reached. Oven doors and barbecue lids close right over the heat resistant 45 inch cable (not for use in microwaves). Large numerals on the LED screen display both the cooking and desired temperatures, and a switch on the back gives a choice of Fahrenheit or Celsius. The slim, oval shaped thermometer has a hinged stand that lets it sit anywhere, as well as a removable magnetic holder that attaches it to the side of an oven or refrigerator. 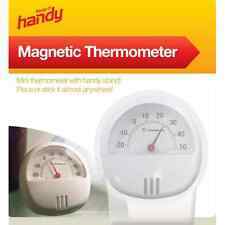 Measuring 3 1/4 by 5/8 by 2 1/4 inches, the thermometer comes with one AAA battery and a five year warranty against defects. Certification: Manufacturers certificate of compliance available from DeltaTRAK, NIST Traceable, CE. Compliance Certificate: Manufacturers certificate of compliance available from DeltaTrak, NIST Traceable, CE. (Clock, Indoor temperature & Indoor humidity display. - Humidity Range - 20% - 99% when the humidity <20% RH it will display <10% directly). 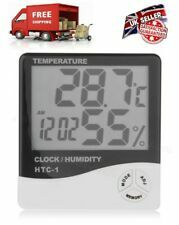 - Recording Max/ Min Temperature and humidity value automatically. CDN's Insta-Read® Long Stem Fry Thermometer is specially designed to make sure that the proper oil temperature is maintained while deep frying. This thermometer features a 12-inch stem and can be used with any size deep fry kettle. An adjustable stainless-steel clip makes it easy to attach to the side of a kettle for continued temperature monitoring. Made with a durable laboratory glass lens, that is waterproof, and stainless-steel housing. 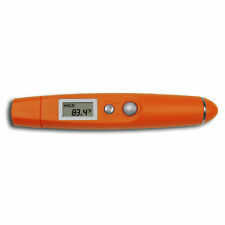 The thermometer has a temperature range from 100℉ to 500℉ (38℃ to 260℃), and can easily be read with the 1 ¾ inch dial. Model: IRL500. Extend the probe up to 180 degrees or lock it into the handle for pocket safe portability. Perfect for grilling, tailgating or camping. Folding Probe. I got weight loss surgery to try to get my life back. Type K probe. Thin tip probe. 3 ft curly lead. Under no circumstances can we take back an item that has been used. Tundra was started in Boulder, Colorado in 1993 – over 20 years ago. It's very important to us that you are happy with your order. Temperature readings for current and maximum temperature. Ultra-portable; Easy to carry everywhere. Data Hold Function. Ideal for fridge and around the house. Easy to read dial gauge. Temperature gauge -20C to -50C. With handy stand. CDN Replacement Probe for DTTC probe thermometers. The new high-heat sensor cable has the ability to withstand temperatures up to 716℉ (380℃), ideal for grilling, broiling, and other high-heat applications. The cable measures approximately 3 feet (91.4 centimeters). The probe measures approximately 5 ½ inches (14 centimeters). Recommended: Clean the thermometer stem before each use. Important: Do Not use probe in the microwave, only the probe can be submerged in liquid. The cable/probe connection is not waterproof. Model: AD-DTTC. Perfect for outdoor grilling, cooking, bbq use. Easy and quick to use digital lcd screen and put into any food within 10 seconds. Battery type: AAA Battery. 1-Year Warranty. Made in China. 2 AAA Alkaline Batteries (included). Food-Safe ABS Plastic. Battery Status Indication. One-Button Operation. 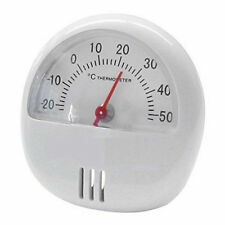 This thermometer instantly ascertains the temperature of foods, whether they're on the buffet line or being cooked. Its 1 inch dial, protected by a shatterproof plastic lens, displays temperatures from 0 to 220 degrees F. The thermometer comes with a pocket case and has a 5 inch stainless steel stem. Should it seem to be off kilter, the thermometer can be recalibrated by twisting the hexagonal hub beneath the dial with pliers. 200 mm (~8") Sharp Tip probe. Probe cover with pocket clip on back. x 7.87 in. (L) (3.5 mm x 200 mm). Display Reading Update: 1 second. Battery: Button Cell Alkaline. Display Window Size.77 in W x. 37 in H (19.5 mm W x 9.5 mm H). 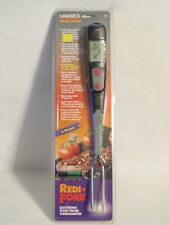 King Kooker SI5 5-inch Deep Fry Turkey Meat Thermometer with Clasp Probe Size 5"